John Bunyan's stunning allegory is still as fresh today as when he wrote The Pilgrim's Progress in the late 1600s. A simple earnest pilgrim, Christian, makes his way toward the Celestial City, receiving either help or hindrance along the way from various characters - Faithful, Talkative, Hopeful, and Ignorance, to name a few. This deluxe collector's edition is unabridged and includes helpful textual notes and Bible references in the page margins. - Publisher Bunyan's allegory is still as fresh today as when it was written in the late 1600s. Includes helpful textual notes and Bible references in the page margins. 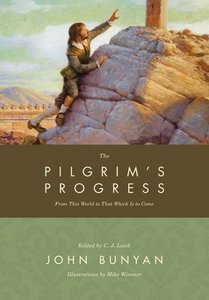 About "Pilgrim's Progress (Deluxe Christian Classics Series)"
Bunyan's allegory is still as fresh today as when it was written in the late 1600s. Includes helpful textual notes and Bible references in the page margins. Customer Reviews For "Pilgrim's Progress (Deluxe Christian Classics Series)"